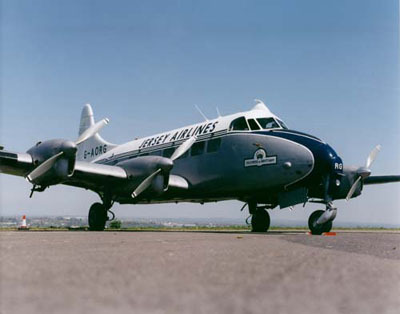 The de Havilland Heron G-AORG Duchess of Brittany is a living link with Jersey Airlines. In many ways it embodies the spirit of the age, an age when flying was still an adventure and when service counted for something. This smart little aeroplane (nicknamed when it first appeared the "Clockwork Viscount") belongs to a group of twenty enthusiasts, all of whom are passionate about keeping it in the air. Because it flies on a private category certificate of airworthiness 'RG cannot be chartered. So, the burden of its annual maintenance and the hourly flying costs falls on the owners. However, from the day it arrived back in Jersey after its restoration in 1991, the Heron captured the imagination of the public. Many associate it with the heyday of British airlines - the 1950s. At its Open Days, twice a year, men and women of a certain age come on board to inhale the distinctive smell of the red Rexine seats which reminds them of flights to and from boarding school. And, in thanks for the effort made by the aircraft's owners, they and others have signed up as Friends of the Heron.